Wilmatte Porter Cockerell and Theodore Dru Alison Cockerell, 1935. Smithsonian Institution Archives, Accession 90-105, Image no. SIA2008-1019. Nothing brings a couple together like scientific research, right? Celebrate Valentine’s Day by exploring a love so deep, new species were named about it. Have you ever loved someone so much, that you named a new species after them? Well, the average person might not be in the business of finding new species, so perhaps some roses and chocolates will do for your partner this Valentine’s Day. Born in Norwood, England in 1866, entomologist and biologist Theodore Dru Alison Cockerell had an early interest in natural history. By age twenty, he began publishing papers and in 1890, after a brief stay in the United States, he returned to England to work for the British Museum of Natural History. The next year, he moved to Jamaica to work as a curator at the Public Museum of Kingston. In 1891, Cockerell married Annie S. Fenn, and they had two children. Annie died in 1893, and both of their children passed away before the age of ten. After his wife passed, Cockerell made the decision to move to New Mexico to be a professor of entomology and zoology at New Mexico Agricultural College. Wilmatte Porter was born in Leon, Iowa in 1869, and excelled in biology, studying at Stanford University. Beginning in 1899, she taught at the New Mexico Normal School, where T.D.A. Cockerell began working in 1900. The two worked closely to establish an agricultural experiment station and later that year they were married. For the next forty-eight years, the two traveled on collecting expeditions together, discovering new species, many of which were sent to the Smithsonian and included in curators’ reports. The two explored various parts of the Unites States, Japan, Africa, Guatemala, and beyond. From their trip to Guatemala, the Cockerells sent new specimens to Smithsonian’s Department of Botany in 1912. Botanist Joseph Nelson Rose named one of the species of cacti Wilmattea minutiflora in Wilmatte Porter Cockerell’s honor. But that is not the only species named after the biologist. Theodore Cockerell named many of his discoveries after his wife. Species sent to the Smithsonian and named by Cockerell included Exomalopsis wilmattae, Ptiloglossa wilmattae, and Teucholabis cockerellae, to name a few. And come on now, doesn’t every child wish their partner would name a species of sea slug after them when they grow up? 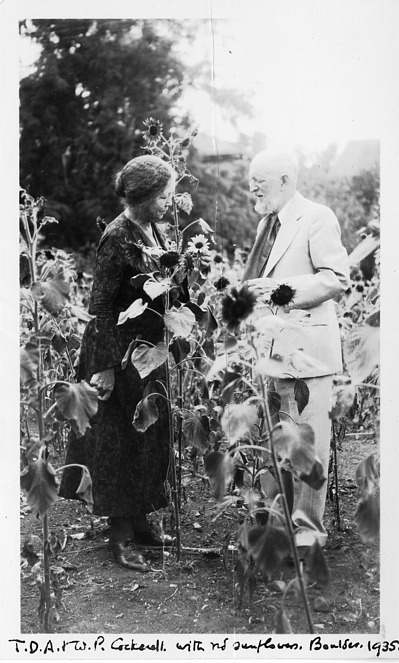 Together, the couple also notably discovered a red sunflower near their home in Colorado, where the Cockerells lived beginning in 1903. They dug up the flower and brought it to their garden to cultivate and study. They eventually cross-pollinated the flower to produce a species with a certain red color. For their work on the red sunflowers, they won a medal at the Panama-Pacific International Exposition in 1915 in San Francisco. Throughout their careers, they were also passionate about spreading ideas about conservation. The couple collected a series of films related to natural history conservation which they brought with them on trips and showed to public audiences and children, alike. Whether or not you have a “constant companion” this year, we wish you a happy Valentine’s Day! Gardner, Sue Ann. “Theodore Dru Alison Cockerell.” Faculty Publications, UNL Libraries (1999): 109. Michener, Charles D. “T.D.A. Cockerell.” Journal of the New York Entomological Society 56 (1948): 171-174. Biodiversity Heritage Library.